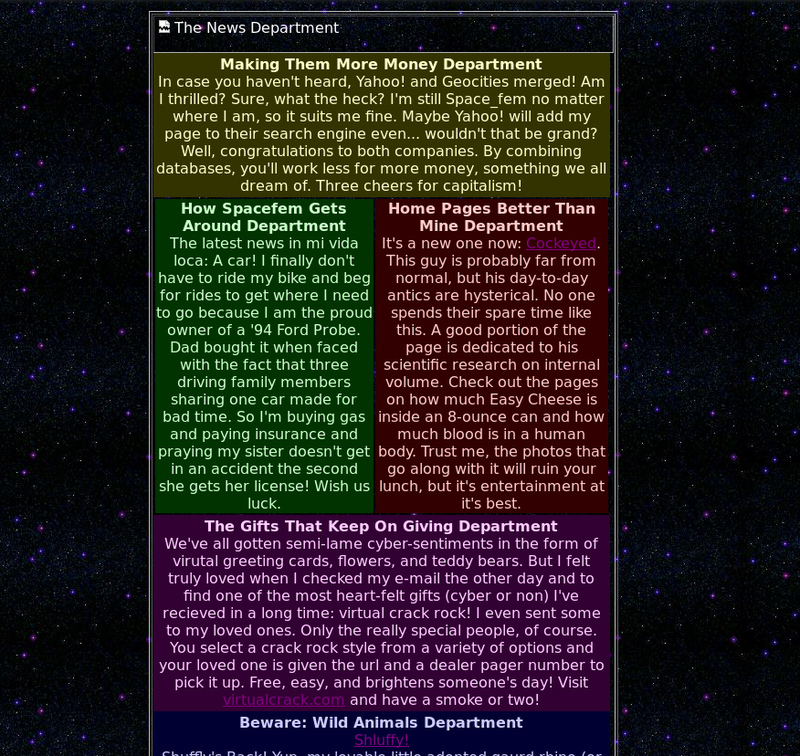 I accomplished something this week: finally got to a new years resolution to make my spacefem.com homepage mobile-friendly. It was a struggle, friends. I wanted to keep it simple but the world seemed... not simple. I wondered if I should go to wordpress or install some other huge CMS. I found all these templates with "installation instructions". 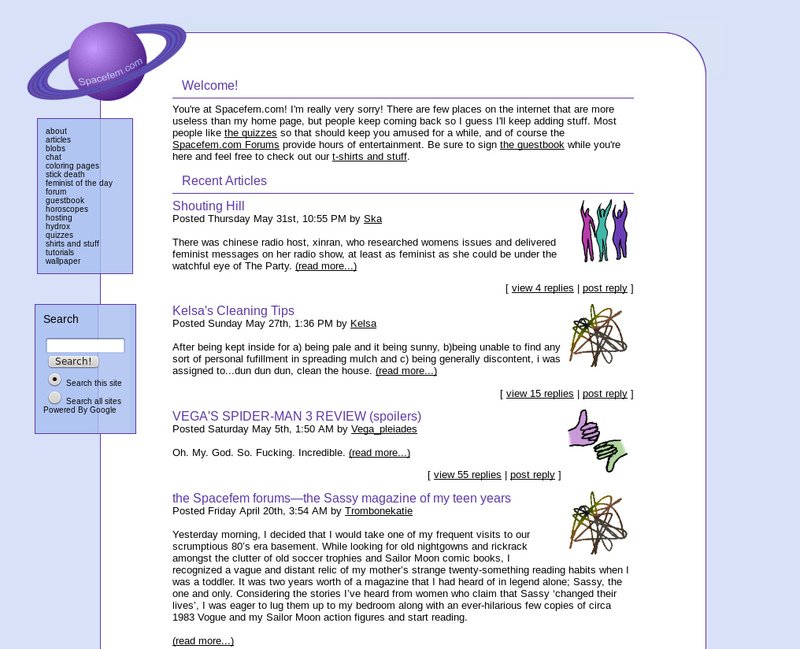 but just for fun I stepped back in time a bit, with the help of archive.org, to simpler times. 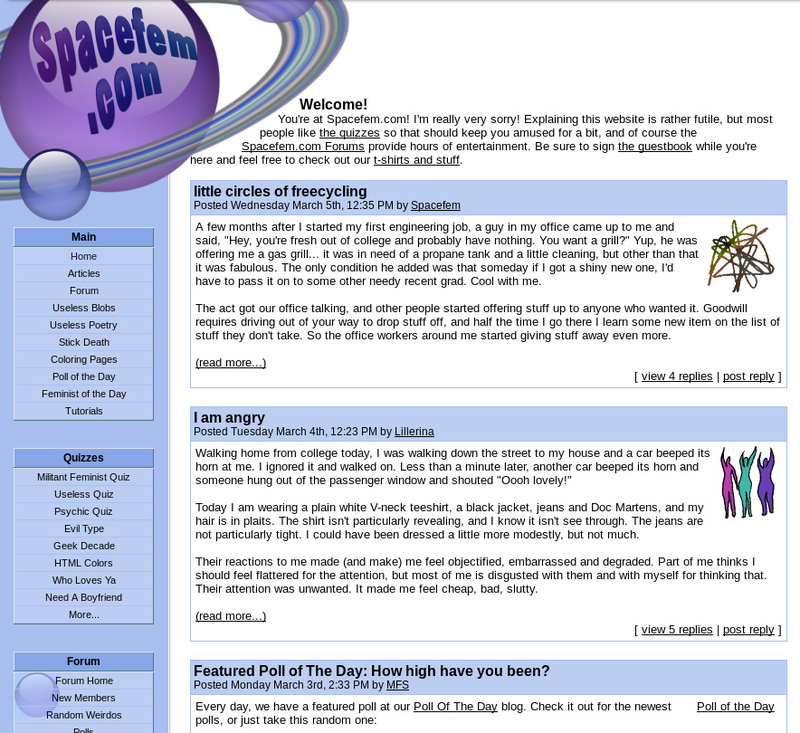 When there was only HTML. 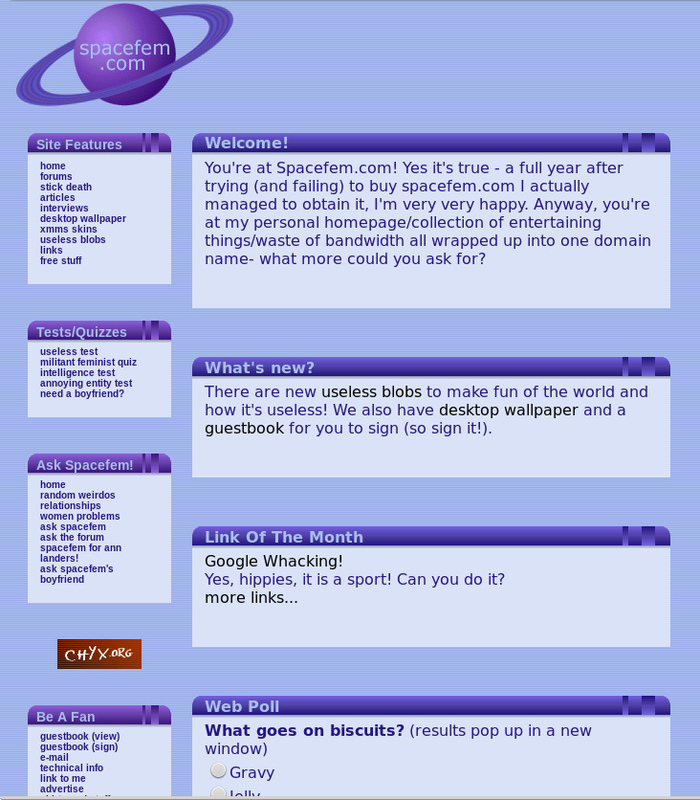 Yes that time existed for me, because I started this page on geocities in 1999. 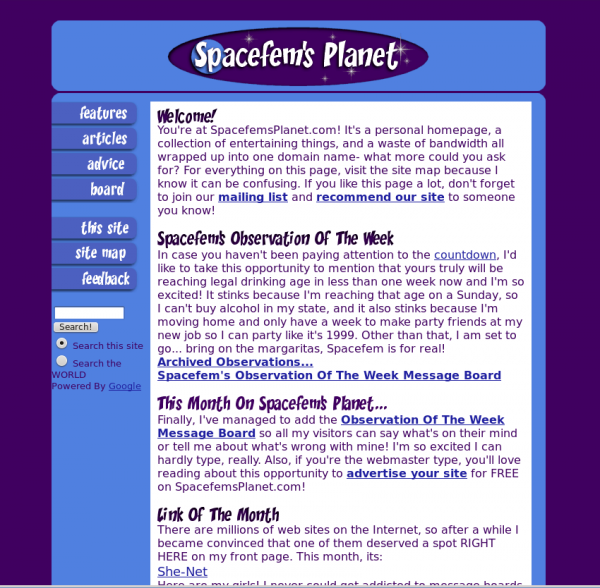 There's not much of the old geocities stuff... it was in the wellesley neighborhood, I had a starry background and was making lots of my own images but I was against themes because, well, geocities! and then I redesigned every few years. I have to say I totally love this 2004 kinda retro line art thing. 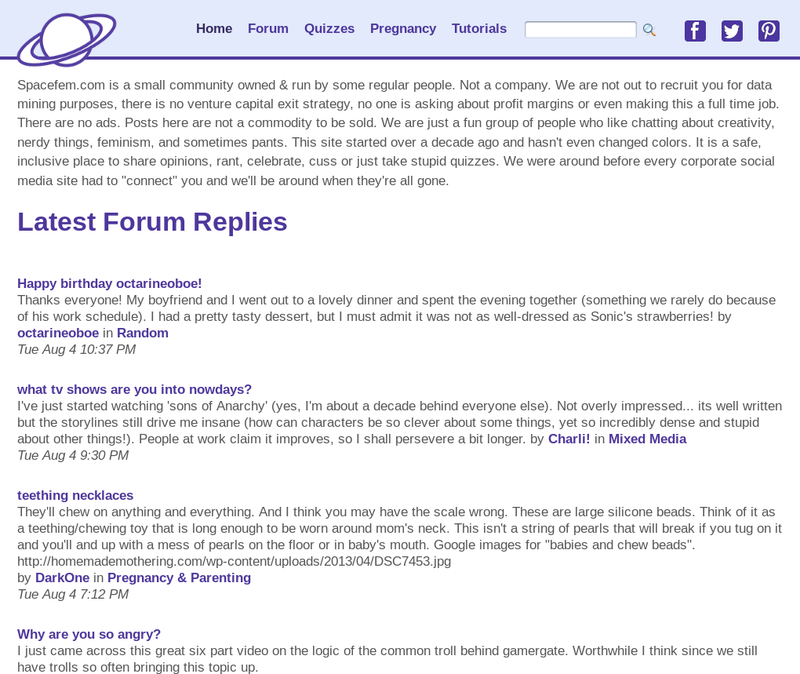 And it's the first year that the forum with all its members started being the driving force of the website instead of just me. And do you love the dedicated space for 88x31 buttons? Looking at these I actually worry that the internet is all trending to boring... neutral backgrounds, no color. 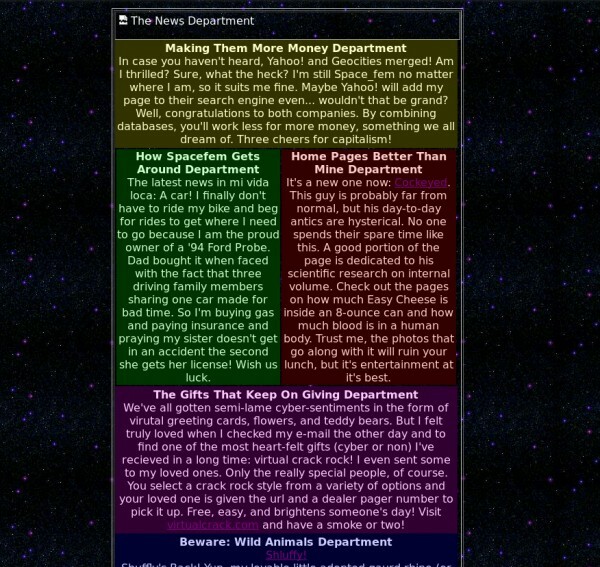 There's this scene in the movie "Night At The Museum", made in 2006, where the main character goes to do "internet research" and all these pages look totally unique, charming and different. The page about the grand canyon is rocky brown and rustic looking, a page about a castle has buttons and a header that look like stone. People started from scratch and designed whatever they wanted. Sometimes it was awkward or ugly but it was diverse and definitely unbranded... like an old protest march where everyone's signs were hand painted. I miss that internet. I think 2005 or so was our peak, it's all downhill from here. Nice walk through the internet past! 2004/2007 are my favs, I think. I kind of miss the 2012 planet, to be honest. And more color. 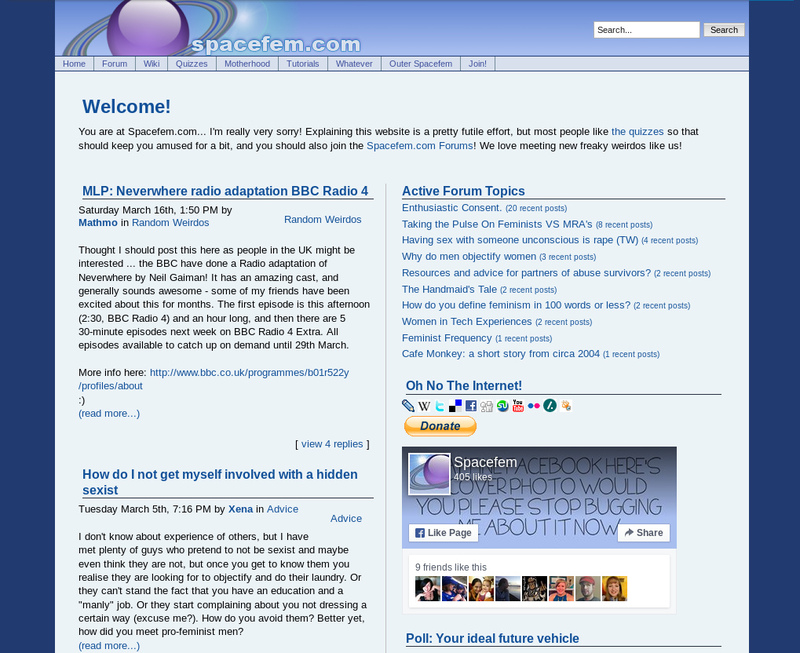 It's fun to see the stuff that existed before I arrived on the forum. :D 2001 fonts! Haha, one of my post is on one of those screenshots! Crazy! I could never understand how 88x31 came to be chosen. It boggles the mind. 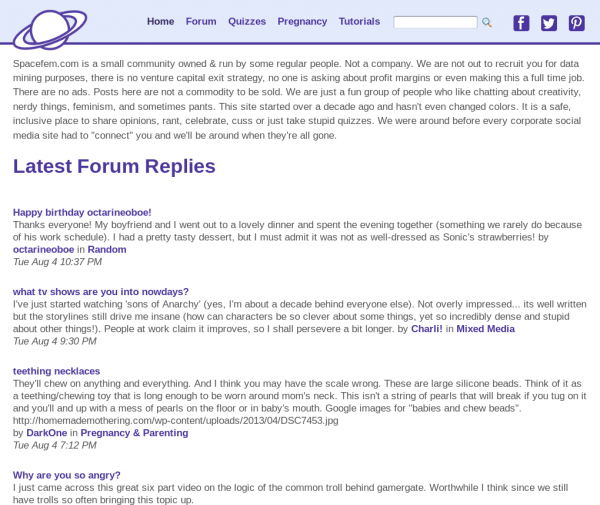 internet communities seem to be best when they're driven by a cult of personality. That personality attracts the new life, usually due to something that they do outside of the community/forum/etc, and then inevitably, they no longer have time, or interest, and it turns into a semi-democratic type of situation with its own lifeforce. But it's different after that point. I don't think I ever used the spacefem boards back then, so I'm not saying this specifically about your site and you backing off from it, but I've seen it happen in so many communities I've been a part of. It truly seems inevitable.